I have managed a bit of a catch up on the How Far Will You Go? QAL blocks. It's been a little while since I've worked on this and I've fallen in love with the fabrics all over again. It's so fun picking out which ones to use in each block. I have no grand plan, I just chose fabrics before starting work on each block. Here's a collage of all the other blocks I've made so far, with no accurate depiction of scale mind you! I really am learning a lot doing this QAL and the blocks are so fun thanks to the great tutorials by Jess and Jess. They've actually posted all the tutorials now and I'm playing catch up as there is another couple of weeks before they focus on putting the blocks together. I'd really recommend checking it out! Such pretty, sunny blocks! It is going to make a great quilt! They're looking so great Lu - love the palette. I'm so glad you're enjoying it :o) we've had a great time (albeit slightly stressful) putting it all together! Lovely colours Lucy, very juicy! They're looking gorgeous together, Lucy! Such fun colours! Really gorgeous bee blocks. Think I need to pin Clay's Choice's blocks. They are all so pretty! 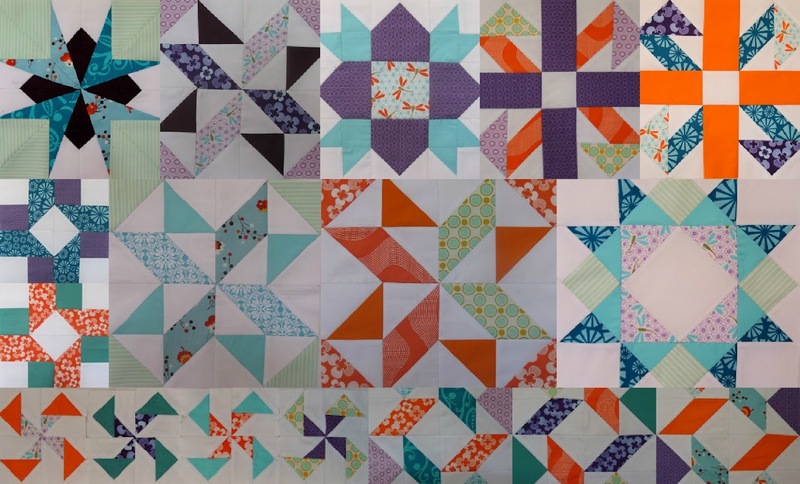 All those hsts would have reduced me to tears a few months ago but I'm getting the hang of it and made a block a lot like your first one and it was nearly perfect!!! It was for a bee. Your blocks look so amazing all together! It's going to make a beautiful quilt one day. It would be impossible for me to pick a favorite block because I like them all. Great job! All lovely it is going to be fabulous! You are brilliant! They look so cool all together! Love the Dutch Rose block! It's a beautiful palette you're working with. wow, these blocks are gorgeous!!! Love your pretty fabric, it makes me happy just looking at it. The blocks are amazing! Great collage!